SEATTLE – Sounders left back Nouhou spent much of the winter wondering which side of the Atlantic he’d be playing on this season. But as rumors swirled that he’d be loaned out to French sides Stade Rennais and Olympique Marseille, or Italian squad Palmero, the Cameroon native tried to stay focused on a personal fitness regimen he’d started earlier this offseason. Some healthier eating habits and increased gym work left him 6 pounds lighter, looking less top-heavy and prepared to bring an added speed element to his game. 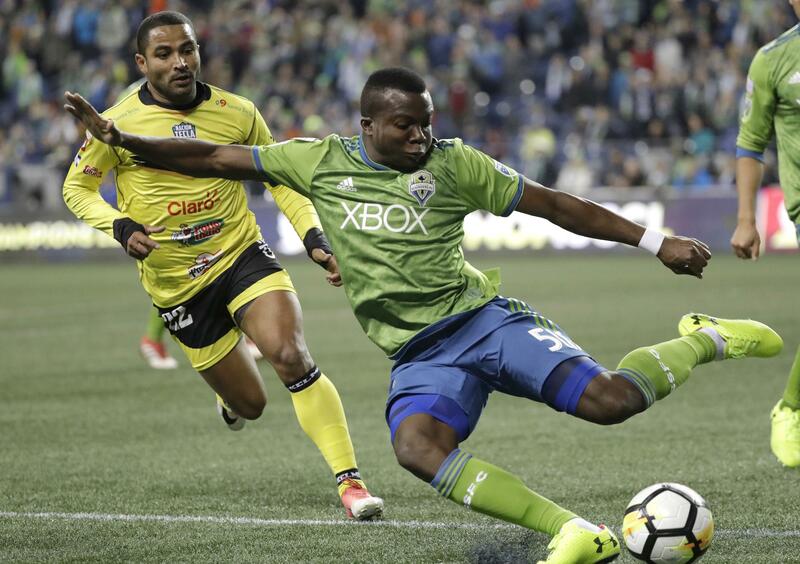 Nouhou’s arrival in camp was all the Sounders needed to execute a deal that sent veteran left back Waylon Francis back to the Columbus Crew for $50,000 in General Allocation Money. Francis, 28, was brought in a year ago to push Nouhou, but was beaten out for playing time by him and July loan import Brad Smith from the English Premier League. Now, as then, the only serious left back competition in training camp – which continues in Arizona for 12 days later this week – is whether it’s third-year defensive stalwart Nouhou or the more offensive-minded Smith who gets the majority of starts when the Major League Soccer season opens next month. Both could start for several MLS teams, though Nouhou is still only 21 and thought to have plenty of untapped potential. Nouhou’s personal focus on his overall fitness has to be a welcome sign for the Sounders, who wondered about his maturity at times last season and were perplexed with his getting caught up the field on defense after some extended runs. Smith’s speed is a major plus for his game and anything Nouhou – already fairly quick for his previous 5-foot-10, 175-pound heft – can do to improve upon his would help narrow any gap between him and the more veteran defender. “I think I have to be more decisive this year because that’s what was missing from my game,” said Nouhou, who at times appeared caught between his offensive and defensive transition game. “I think I have to stay encouraged and not put too much pressure on myself because I’m 21 and I already have two years behind me with Seattle. The Sounders, dating back to DeAndre Yedlin, have viewed their fullbacks as an integral part of their offense. Much was lost on offense when Joevin Jones headed to Germany after notching a goal and 11 assists in 2017 and was followed last season by Nouhou and Francis combining for just two assists between them. Sounders general manager Garth Lagerwey said Tuesday it was apparent Francis was the odd man out once Nouhou made it through last week’s European transfer window without a deal getting done. Francis had been left off a trip to Portland last summer after expressing his displeasure over a lack of playing time in a training session. Alhough he later apologized and made it through season’s end without further incident, it became clear he’d be no higher than third on the left back depth chart this year. With Smith a candidate to be recalled by his English Bournemouth team in August, Nouhou may ultimately be the only legitimate left back starter come season’s end. “I heard all of it,” Nouhou said. “But for me, I was a little disappointed in my season last year and going to France wasn’t going to fix everything for me. I knew that the best thing was to concentrate on coming in here and doing the best I can to reach my potential. Published: Feb. 9, 2019, 4:49 p.m. Updated: Feb. 9, 2019, 10:13 p.m.